You are here: Home › Further › Education › Female Athletes Inspire School Students at Uxbridge College’s “This Girl Can” Event. International athlete Chelsea Alagoa and sports therapist Kaydene Parker headlined an inspiring day of talks and activities at Uxbridge College for local secondary school students as part of the This Girl Can, the national campaign to encourage more girls and women to exercise. They spoke about their own sporting careers and passions. Chelsea (pictured) is a former member of the GB Bobsleigh Team, medal winning guide runner for international para-athletes and now plays basketball for Brunel University. She encouraged the girls to make the most of every opportunity that crosses their path and to take part for the pure enjoyment of being active. 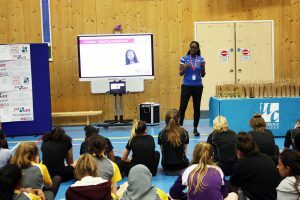 Kaydene is a former Uxbridge College student, who qualified as a Sports Therapist at University of East London and now works in the role of Sports Academies Coordinator for the college’s football, netball, basketball and cricket teams. She is also in private practice with Thames Valley Cavaliers National Basketball Club. The day included a series of sporting activities, aiming to evoke excitement about participating in an active lifestyle, including: Tchoukball, Quidditch, UV Table Tennis, Aerobics, Danish Longball and Netball Shooting. There were also educational activities run which dealt with body perceptions, biomechanics and exercising at home. The netball shooting activity was run by the college’s This Girl Can student ambassadors who were eager to spread the word about the importance of sport and the many opportunities in the sector for girls of their age. Ellie Newman, Course Team Leader for Sport, who led the event said: This was another really successful event – our two guest speakers were a real inspiration. It was also great to have students from in and around the borough on site to make use of the enthusiasm of our staff, as well as our fantastic facilities, including our full size professional basketball court which we use for a wide range of sports. We hope the day will inspire more of the girls to take part in regular exercise and to also consider studying or working in the thriving sports industry or even becoming professional sportswomen! This Girl Can events have been running at Uxbridge College since 2015 and continue to bring healthy and enjoyable sports participation to the forefront of the minds of the next generation.